Other names: Common Juniper, Fairy Circle, Gin Berry, Horse Savin, Dwarf Juniper, Prostrate Juniper, Gin Plant, Wachholder, Reckholder. Habitat: Juniper is widely distributed throughout Northern Hemisphere: Arctic, Africa, Europe, Asia and Central America. 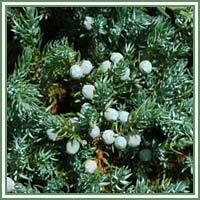 Description: Juniper is a coniferous, evergreen tree. It has a thin, fibrous bark, brown in color and spreading and ascending branches. Leaves are simple, arranged in whorls of three, usually green. Fruits have are berrylike seed cones, globose to ovoid in shape. Parts used: Ripe dried and unripe fruits, leaves. Useful components: Gum, lignin, salines, sugar, resin, volatile oil, wax. Medicinal use: The plant is considered to have carminative, diuretic and stomachic properties. 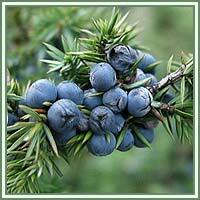 The Juniper oil is the most common form used for diverse complaints. It is used in cases of flatulence, indigestion, cardiac and hepatic dropsy, kidney and bladder disorders. Unripe berries are consumed to promote healthy blood pressure, kidney and urinary functions. Traditionally, berries have been used in treatment of gout, warts and skin regeneration.